Binion’s is an original downtown Hotel Casino that has changed very little over the decades. 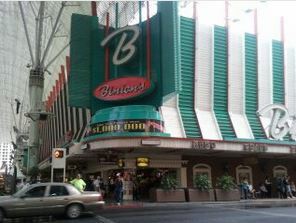 Binion’s is under the canopy of the Fremont Street Experience so staying here is very convenient and safe. You have no need to leave the secure area of the Fremont Street experience during Your stay, You will be able to visit at least 6 other casinos without leaving the Fremont street Experience Canopy. Binions is a 2 star hotel and knowing that, expect it to be all You need for sleeping and that’s about it, You will not be spending a lot of time in the room if You choose this Hotel.